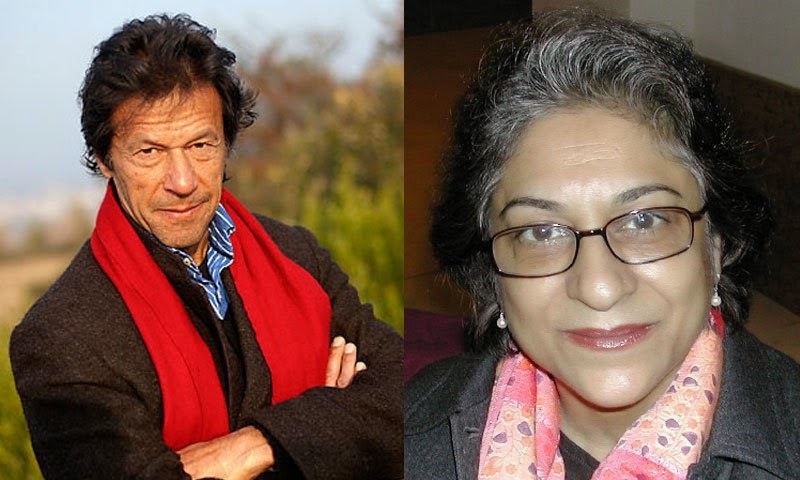 Will Asma Jahangir vs Imran Khan war of words escalate? Will it lead to more insults in public discourse? Why is veteran US diplomat Robin Raphel being investigated by the FBI? Did her views considered "pro-Pakistan" contribute to her dismissal? Why was Indian Prime Minister Modi absent from APEC Summit in Beijing? What did Prime Minister Nawaz Sharif accomplish in China? How will $43 billion Chinese investment help Pakistan? Why are some Pakistani private schools celebrating "I'm Not Malala" day in Pakistan? ViewPoint from Overseas host Faraz Darvesh discusses these questions with Ali H Cemendtaur and Riaz Haq (www.riazhaq.com). Imran Khan Arrest Warrant, Modi's Absence From APEC, Robin Raphel Investigation from WBT TV on Vimeo. Sometime later, Modi protested attacks on Gujarathis in Kenya. Very recently, he has addressed thousands of hindus in New York and Sydney. Cannot all these people be construed to be anti-national to their countries of adoption? The bottom line is that the jury seems to have succumbed once again to stereotypes conveyed in the media. Pakistan is presented there as an Islamists stronghold where girls can't go to school. While this may be true for the areas bordering Afghanistan and many villages in the countryside, this is certainly not the case in large cities such as Karachi, Lahore, Quetta or Islamabad. In these places you can even find elite universities for young women. In large cities, gender is not the decisive factor for determining someone's education prospects, but rather personal wealth. India, on the other hand, is portrayed as an emerging, mostly peaceful, economic power with one major stain: the wealth of the elites is based on the bonded labor of lower classes, and especially on child labor. Hence it fits the picture that Oslo chose Kailash Satyarthi, a crusader against child labor, for the Nobel Peace Prize. But some tend to forget that India is also home to religiously and socially motivated violence, a lack of education opportunities for girls. After confirming these stereotypes, Western countries may now lay back and think that they at least have done something symbolic for the region. But the truth of the matter is that in terms of real politics, badly needed concepts for the future of the subcontinent are still missing. The Raphel case has also been caught in the crosswinds of America’s tempestuous relationship with Pakistan, a strong Cold War alliance that has frayed since the Sept. 11, 2001, attacks amid recriminations between Washington and Islamabad. Ms. Raphel has for decades been at the center of shaping American policy toward Pakistan, and she has maintained close ties to Pakistani officials even as many of her colleagues became disenchanted with what they saw as Islamabad’s duplicity in the fight against terrorism. Against that backdrop, the federal investigation has delved into the murky world of international statecraft, where diplomats exert influence through a careful dance of trading, sharing and eliciting information. Some American investigators viewed Ms. Raphel’s relationships with deep suspicion. Those suspicions became a federal investigation last year when American officials, while eavesdropping on a Pakistani government official, intercepted a conversation that seemed to suggest that Ms. Raphel, an adviser at the State Department, was passing American secrets to Pakistan. The reason for the eavesdropping is unclear, but the government routinely listens to the phone calls and reads the emails of foreign officials. After months of secret surveillance, the investigation into Ms. Raphel spilled into the public when agents searched her home and her State Department office last October. She was quickly stripped of her security clearances and left in the dark about the precise origins of the federal investigation. Her friends said that the investigation had taken a deep emotional toll. American officials will not discuss what classified information the investigators found in Ms. Raphel’s home. The current and former American officials who discussed the case did so on the condition of anonymity because they were not authorized to talk about it publicly. Over the years, the stories of American officials mishandling classified information have at times seemed as peculiar as they were serious. John P. O’Neill, a counterterrorism specialist for the F.B.I., once lost a briefcase full of government secrets in a Florida hotel. Samuel R. Berger, the national security adviser to President Bill Clinton, stole classified documents from the National Archives and hid them under a construction trailer. As attorney general, Alberto R. Gonzales took material about the nation’s warrantless wiretapping program home with him.